Dhaka (Agenzia Fides) - The Catholic Church in Bangladesh reiterates its mission of witnessing the Gospel in a Muslim majority country: this is what emerged from the meeting that saw the gathering of Bishops, priests, nuns and lay people from the whole nation in Dhaka in recent days, engaged in a debate on the theme "Communion: the Christian witness of the Church in Bangladesh". As Fides learns, Cardinal Patrick D'Rozario, Archbishop of Dhaka and President of the Bishops' Conference of Bangladesh, reiterated that "the Church in Bangladesh has high hopes for the future". "We all need to witness the Good News in our country with words and actions", he said. The Cardinal also highlighted the many challenges the country and the Bangladesh Church face, urging participants to "collaborate with government officials and all people of good will for the common good". During the seminar, the perspectives of the Church's presence emerged: "We live in a country with a Muslim majority. In this social context, the Church's contribution to education, social development and to every cultural activity is oriented to testify love and peace, God’s gifts", said Sagar Sonjib Corraya to Fides, who was among the participants. 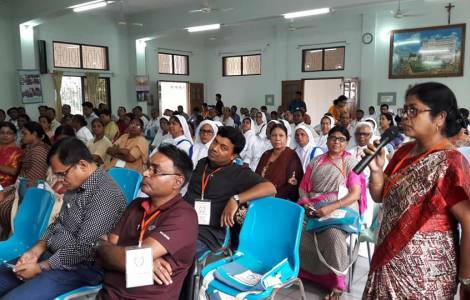 The Catholic community in Bangladesh "looks carefully at young people, women and children in order to educate and strengthen them in faith, with love and commitment", he explained.